A crudely drawn but bitter attack on Andrew Jackson's veto of the re-charter of the Bank of the United States and his subsequent campaign to destroy the Bank. Jackson (right) is a king fiddling on his throne as the Capitol burns in the background. He is attended by Jack Downing, while Vice-President Martin Van Buren peeps out from behind a curtain. Downing: "Jineral jest put a letel more Veto Rosin on your bow and you'ill give us a rale Nero-Doodle of a tune. That are fiddle jineral sound like your intarpitation of the Constitution. you can play ener most any tune you like on it." Jackson: "D-mn the Constitution Major. It is where it ought to be, Under my Feet." Van Buren: "Safety Fun." Before him is a strong chest labelled "30,000,000 Crowns" Beside it kneel three men, the "Reptiles that crawl through their own Slime to the Throne of Power." Beside them is a headstone inscribed "Sacred to the Memory of Dame Freedom, born July 4, 1776 and departed this life Oct.1 1833 A.E [sic]. . ."
A crowd of "Kitchen Scullions & Pat-riots" with asses' ears mill about in the background, cheering for Jackson. They represent Jackson's close circle of advisors, the so-called "Kitchen Cabinet," and his lower-class and often unruly Irish immigrant (ergo "Pat-riots") supporters. 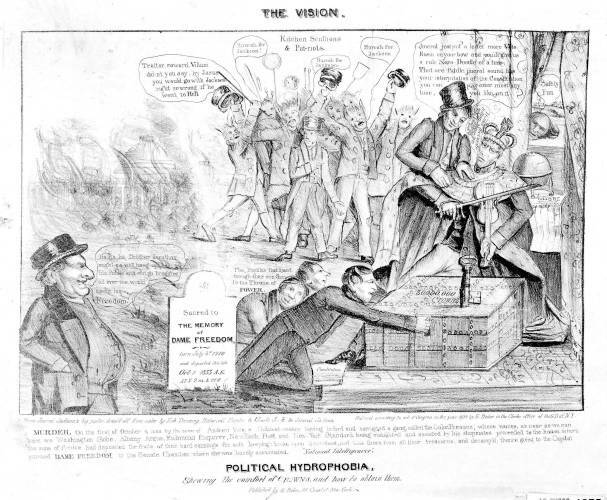 At lower left stands John Bull, who says, "Ha-ha Brother Jonathan might as well hang up his fiddle, and not go bragging all over the world about his Freedom." A text below is a mock report of the murder of Dame Freedom by "Andrew Veto" and the "Color Presses," (i.e. "collar presses" or pro-Jackson newspapers) including the "Globe, Albany Argus, Richmond Enquirer," and others, and the robbery of the earnings of the "Sons of Freedom."